Good news, everyone! It looks like Marvel isn't going to chicken out and Mysterio will have a comics-accurate look, fishbowl helmet and all, in Spider-Man: Far from Home. We initially learned back in May that Mysterio was going to be the villain in the upcoming sequel and that Jake Gyllenhaal had been tapped to play him, even though Marvel Studios has been shy about confirming that detail officially. Rest assured, it's happening and, thanks to some early promotional tie-ins, the character's iconic look has been teased. The info comes from the Candy Kings UK Instagram account, who shared an image of Dr. Pepper that will be released in conjunction with Spider-Man: Far From Home. The designs of the bottle/can aren't finalized, but the can shows the very clear silhouetted outline of Mysterio while noting, "final design to feature major movie character." Quite clear who that character is going to be, but it's the shape of the outline, which clearly shows the fishbowl helmet, that should have fans excited. Here's what the account had to say about the image. "Limited edition Dr. Pepper flavour coming out in 2019 Dark Berry! This will be coming out to celebrate the launch of Spiderman 2"
While this doesn't show off Mysterio in all of his assured glory, we can put the pieces together. Some set photos leaked online showing Jake Gyllenhaal as the villain on set in what looked to be a mostly accurate costume, sans helmet. It's quite possible, for the sake of convenience, that the helmet will be done with CGI at a later time. Or maybe he just wasn't wearing it in those scenes. In any case, get ready to possibly see one of the most awesomely goofy bad guys in the history of comic book movies next year. Marvel Studios has done a great job bringing characters to the big screen with a great deal of accuracy. They didn't chicken out with Doctor Strange, which is pretty impressive. 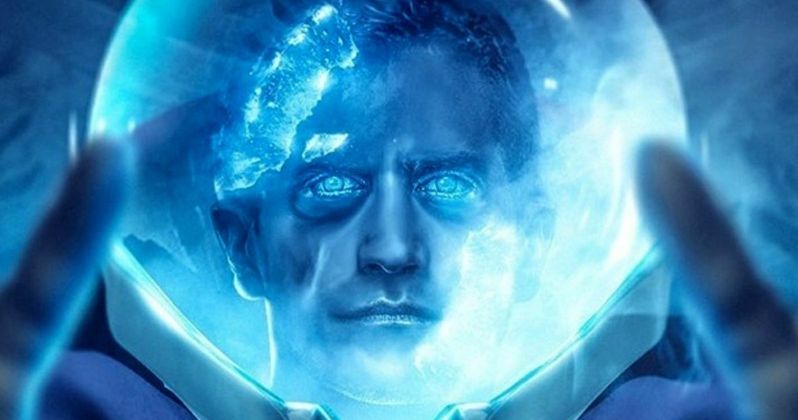 Even so, putting a giant fishbowl over Jake Gyllenhaal's head always seemed like a stretch. But this is what we get when a studio has ten years of good faith and box office performance under their belt. Not to mention that, taken at face value, seeing Tom Holland's Spider-Man do battle with a master of illusion, as portrayed by one of the more dynamic actors working today, is a very different kind of fight than anything we've seen previously from these movies. Jon Watts, who directed Spider-Man: Homecoming, is back in the director's chair for the sequel. This is going to be the first movie in Phase 4 of the MCU following the release of Avengers 4 next summer, so it very much has the burden of expectations placed upon it. Spider-Man: Far From Home is set to arrive in theaters on July 5, 2019. Be sure to check out the promotional Dr. Pepper image from the Candy Kings UK Instagram for yourself below.